My knitter friends in Bangalore aka Bangalore Ravelry Brigade had a Potluck lunch planned last week. In the last minute, I was asked if I could bring along a handmade gift. I don’t sew (which is considered faster than knitting), and I am not that good at crocheting that I could just whip up something in a hurry, so that left only knitting I could fall back on. I didn’t have enough time to search for patterns on Ravelry, sort through them and finalize on one, so I took the easy way out and created something on my own and that is how Swirl Wrist Bag was born. Swirl is a seamless wrist bag with garter stitch base and slanting eyelets on the body. It comes with three options for the strap: garter, stockinette and i-cord. Swirl is quick to knit and is perfect as a project bag for knitters and a wristlet bag for muggles non-knitters. It is ideal for newbie knitters who want to try out provisional cast on, lace and i-cords. The instructions for lace stitch pattern is provided as written instructions and chart. One size: 7” base and 9” height. 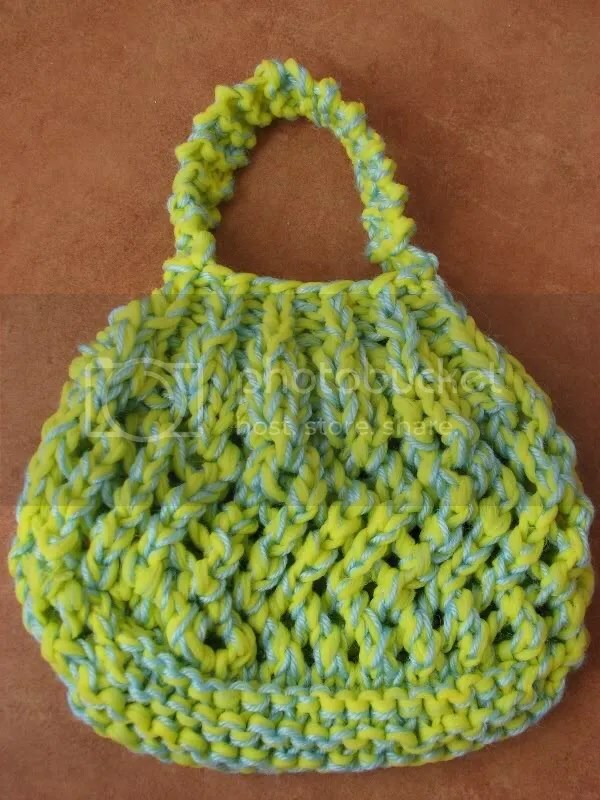 To download the pattern, click on the image above or on the button below. Congratulations you have won the giveaway over at Scraps of Starlight! Oh my God! Really? Thanks so much for the giveaway. I am sure this book will be of great help to me. I will send you my address in a minute. Speaking of contests…. I searched your blog, and your Ravelry post about the contest naming your Tee… I can’t find the “winner” post anywhere… did I miss it? Who do I congratulate? I am so curious to know which name you picked for the cute tee in your previous post! I have a few shortlisted, but am waiting for the pattern to be released so that I can announce the winner and send her a PDF immediately. I don’t want the winner to wait! I love colors and the girliness of this bag!